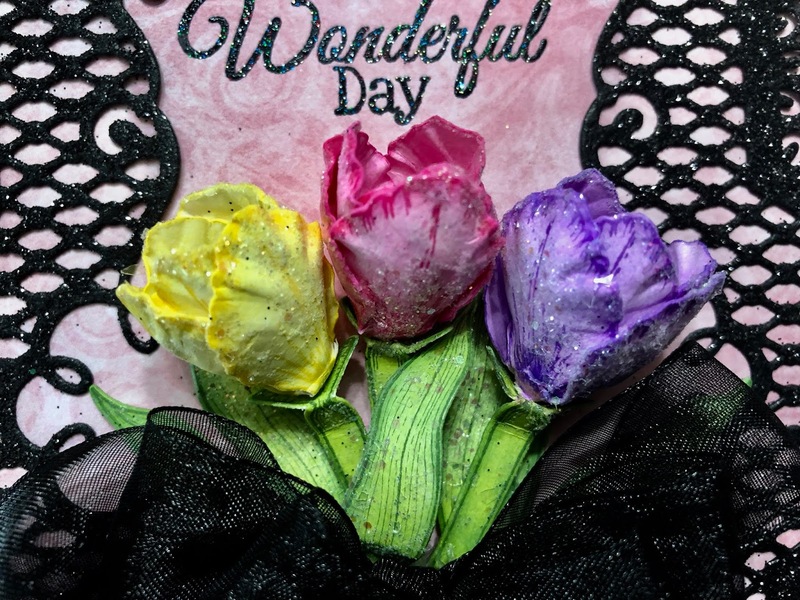 I have another card for you today from the beautiful Tulip Time Collection! For more tips on creating with the Tulip Time collection, watch the tutorial at https://youtu.be/rfYMxeNBmJk. For more tips on creating with the pocket dies, watch the tutorial at https://youtu.be/uDhKUj9AAMo. Instructions: Card size is 6 x 6”. Score and fold 12 x 6” black cardstock at 6” on the long side to create a 6 x 6” tent fold card base. 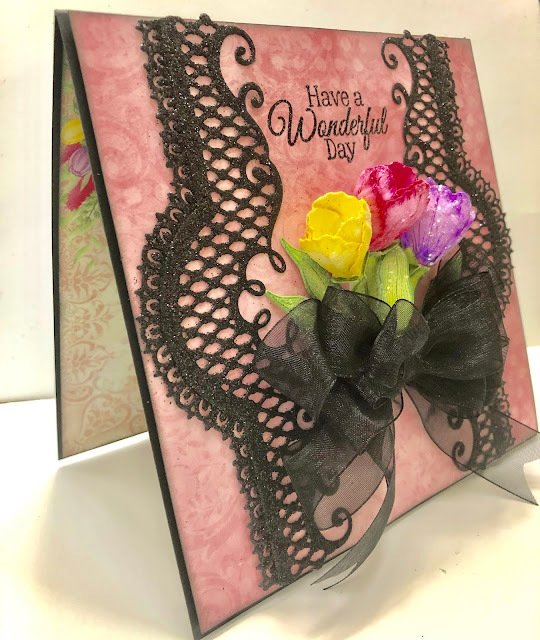 Cut pink designer paper from the Tulip Time Collection to 5 7/8 x 5 7/8”, ink the edges with Distress Oxide Ink – Black Soot. Using the Misti, stamp the sentiment on the pink designer paper using VersaMark, sprinkle with Ranger Black Sparkle Embossing powder and heat set using the heat it tool. Adhere to the card base using dimensional tape. Cut one of the 6 x 6” panels from the paper collection and adhere to the inside of the card using dries clear adhesive. Diecut two of the Petite Pocket Accents Die from black cardstock. Die cut two of the lace edges using the same die set from black cardstock. Adhere the lace edges to the petite pocket accents. Sponge the diecuts with dries clear adhesive and sprinkle with Onyx glitter and when dry, adhere to the card front as shown. Stamp the tulips on floral paper using Buttercup, Majestic Violet and Vibrant Fuchsia inks. Color with the same inks and diecut using the coordinating dies. Ink around the edges, color the backs of the petals and place in the tulip mold. Spritz with water and run through the diecutting machine. Press down in the middle of each petal using the stylus from the Deluxe Flower Shaping kit to further shape the flowers. Pierce a hole in the center of each petal and thread the Rock Candy Stamens through. Add some hot glue to the underside to secure. Use two petals to create each flower making sure to offset them. Stamp the leaves on floral paper using Ranger Olive ink, color using Leaf Green and Olive inks and diecut using the coordinating dies. Shape using the deluxe flower shaping kit. 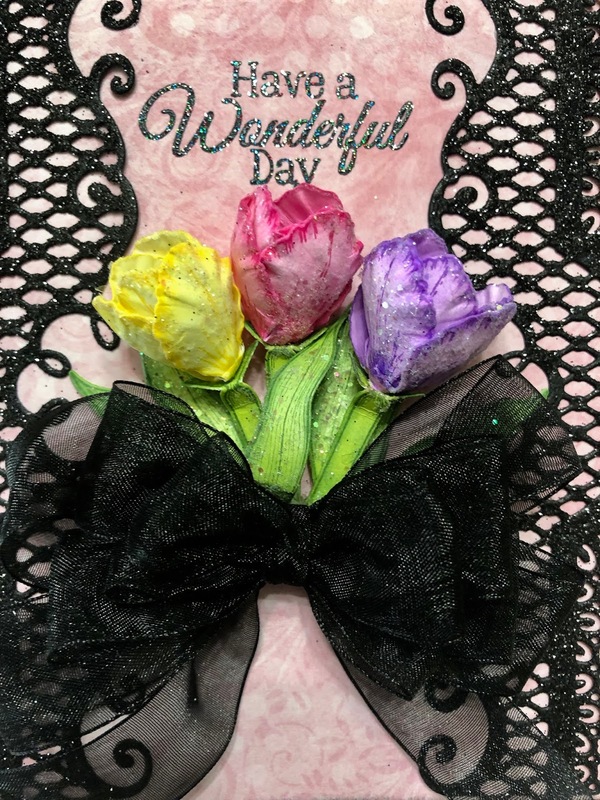 Adhere the flowers to the leaves, sponge with dries clear adhesive, sprinkle with Rajni Chawla’s Crystal Clear glitter and then adhere to the card base using a hot glue gun. Create a black sheer bow using the Bow-It-All 2 and adhere as shown using a hot glue gun. Please be sure to check out the Heartfelt Creations Blog to see all of the gorgeous projects created by the fabulous design team. Oh girl, this is simply stunning! Loving the glittery black! I LOVE this card! It's so gorgeous with that black on the pink, wow!! Wow just stunning!! I love the contrast of the black dies and the colourful flowers and soft pink background! Thank you so much for leaving a comment. I enjoy hearing from you! Hi! My name is Janet Saieva and I absolutely love making cards. Being fairly new at paper crafting, I went to my first convention in September 2013 and after entering the Heartfelt Creations booth, I fell in love with making paper flowers. Now I'm addicted! I've been married to my wonderful husband John for 55 years and we have one beautiful daughter Laura, a handsome son-in-law Rich and three gorgeous, amazing grandchildren Shane, Logan and Rylee. We're very fortunate that they live only 15 minutes away so we get to see them all the time. I always have my camera ready to snap pictures of them. I'm truly blessed!! !